Not ANOTHER Easter Egg Hunt list! As much fun as Easter Egg Hunts are, there gets a point of really? Do we have to watch the same thing over and over? We adults, enjoy watching our young children looking for eggs in an open space with not much of a challenge. How about as they get a little older? Is there anything different? From helicopters and parachutes to flashlights, skate parks, animals and pools, different organizations are starting to think outside of the box. Does this sound more your speed? To me it sounds right up my alley! I love a good treasure hunt and some of these hunts are for teenagers and older. Really, who doesn't love an Easter Bunny Parachuting from the sky after it rains 40,000 Easter Eggs? I have scoured the LA/Orange County areas for something different. Something that might give our children a little something special. 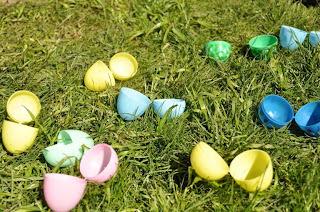 I think that there are enough adventurous people out there that are making a stand against traditional Easter Egg Hunts. While my family can't make every event, I hope that we may make a couple and others can share some pictures of the others so that we may live through them this year and try it ourselves next year! The egg drop sounds like lots of fun! We might just do that! Thanks for the great info.